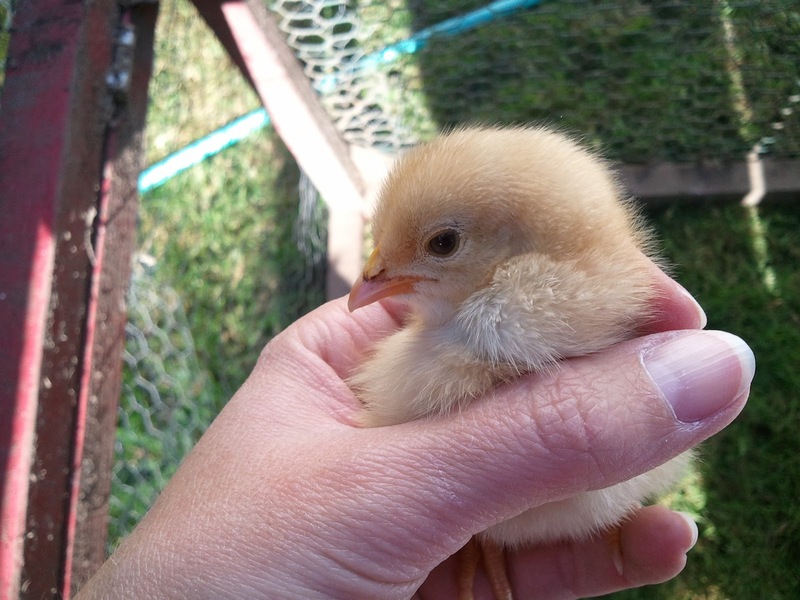 As you may recall we've had several broody hens in our flock. They fly out of the fence, lay their eggs somewhere in the bushes then parade back a flock of chicks to show the other hens how it's done. So far this has not ended well since we have raccoons that frequent our yard and make a buffet from our coop. Well, they did it again. Another mama brought out 11 chicks for the other hens to envy, 6 black ones and 5 light yellow ones. 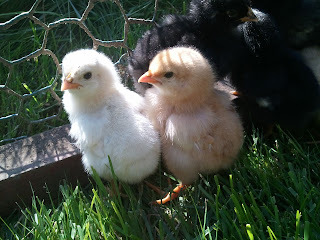 I have no idea what breed these chicks will be. The mother is a Rhode Island Red and the dads could be Barred Rock, Aracauna, Buff Orpington or Rhode Island Red. I really have no idea what color eggs they will lay...if they are hens rather than roosters. Two days later she promptly got eaten by something (probably a raccoon) leaving the chicks peeping in the bushes at 12:30 in the morning. After I heard the peeping through the closed window, Hubby and I ran outside with our pajamas and head lamps to gather up the chicks that were left and put them in the greenhouse with a heat lamp and provisions. 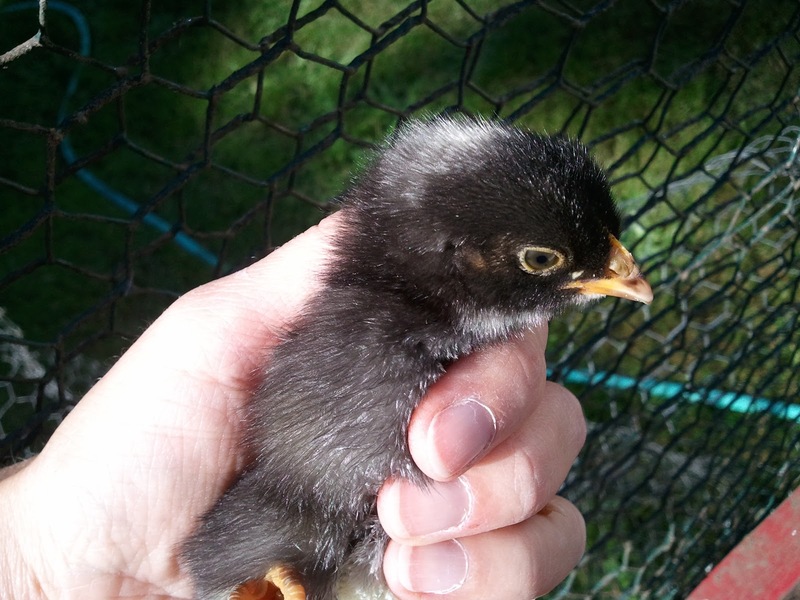 So now we have 8 chicks to raise, 4 black and 4 yellow. The greenhouse is much too hot to be a brooder at this time of year. I went in the day after we rescued the chicks to find the greenhouse at 110 degrees inside. 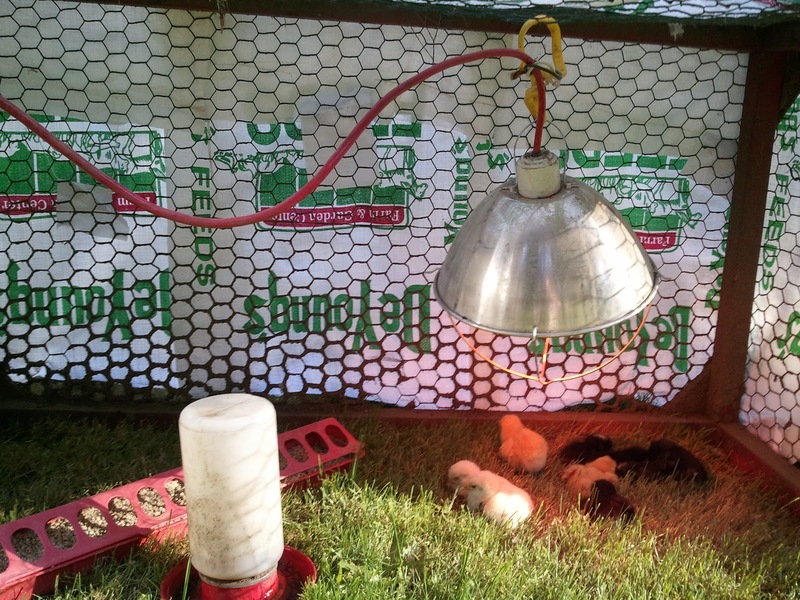 It is a greenhouse, so it's doing its job, but that was not the right place to put 3 day old chicks unless I wanted to broil them. So Hubby took the small run from our original little red coop and put chicken wire on the 4th side that usually attached to the coop. 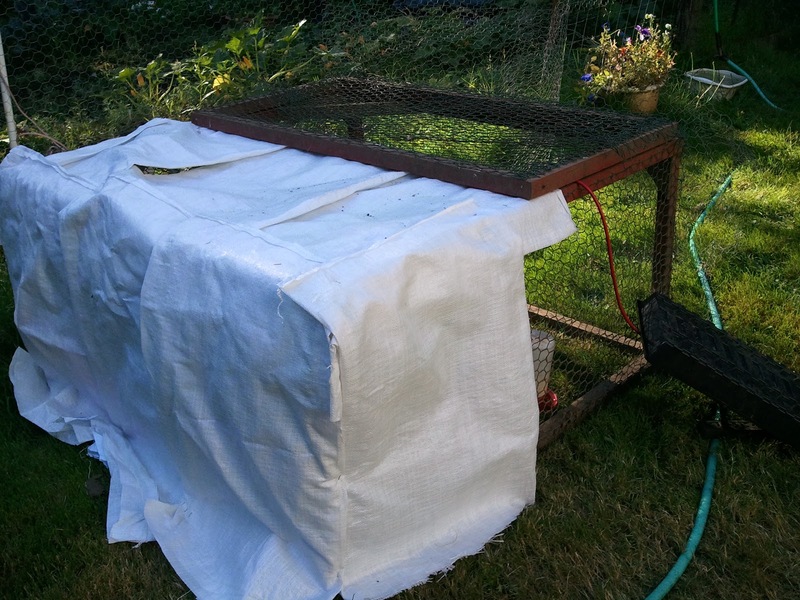 I took some empty feed bags, stapled them to half of the box for shade and rain cover, attached the brooder light to the ceiling in the corner, added water and food and set them loose. So far they seem happy in there. They are scratching at the dirt, eating the grass and snuggling in a heap when they sleep. I had thought of finding another broody hen to raise them, but it's too stressful for me to depend on a chicken to take care of the chicks out in the bushes with all of these predators prowling around at night. At least while they are in our care we can be fairly certain they'll survive for a while.